I've been slowly pecking along on my sewing room re-do over the past month, and I am happy to say that it is almost done now. Yay! I finished painting the walls last weekend. The color is Pinedale Shores by Behr, and I love it like crazy. I also sewed some new curtains for the closet doorways, recovered a stool, painted a spool rack, and refinished a mirror. The mirror was originally boring brown, so I painted it black and then glued strips from a vintage tape measure around the edge to dress it up a little. It's nothing fancy, but I think it adds a fun little touch to the sewing theme of my room. Now I just need to sew a valance for the window and hang a few more things on the walls and then my happy little sewing room will be complete. ﻿﻿﻿﻿Earlier this month, I met up with group of friends from the DFWCG for our twice annual trip to the Antique Elegance Show in Richardson. 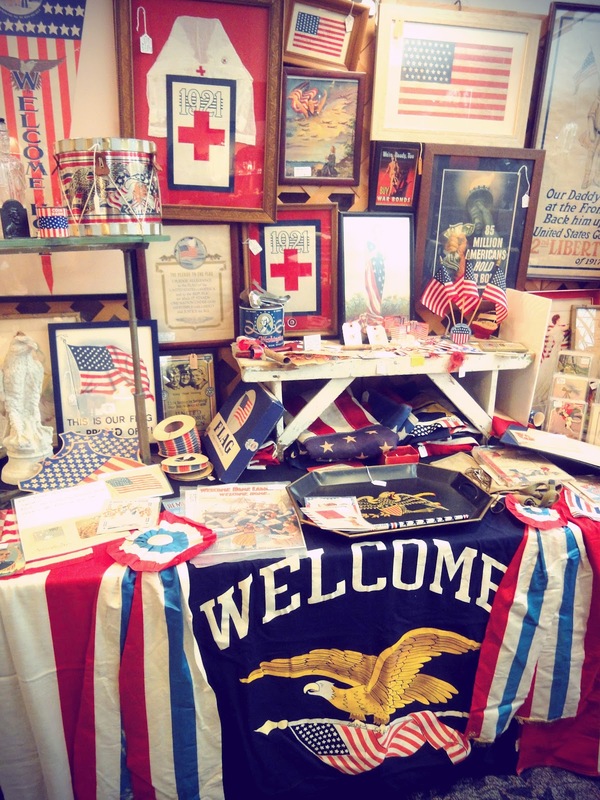 This show features a variety of pre-1960 antiques and collectibles﻿﻿﻿﻿, but the coolest thing about it is that a majority of the dealers sell vintage and antique clothing, textiles, jewelry, and accessories. 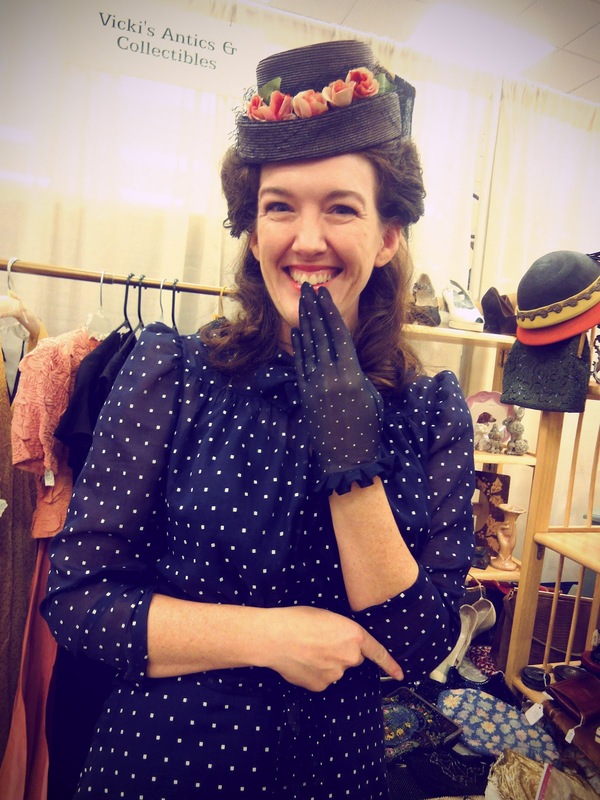 So not only is this a really top notch antiques show, but it is also something of a hands-on fashion museum where you can actually touch, try on, and peek at the insides of 100+ year old garments. It's an amazing experience, and it has really done wonders for my understanding of the construction and materials used in historical clothing. 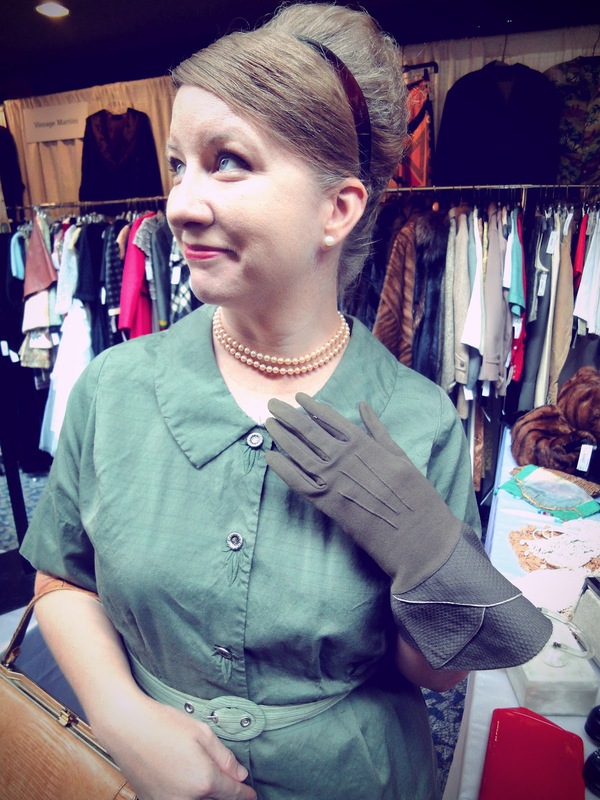 The vendors and patrons at the show are also incredibly friendly, and they always seem happy to humor our quirky habit of dressing up in costume for this show. 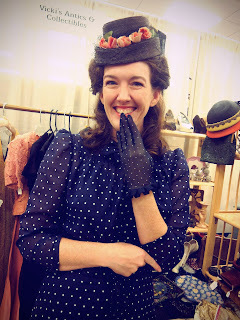 Sometimes we go all out and wear Victorian, Edwardian, or Regency clothing, but this year, most of our group took the easy way out and wore vintage. It's a fun compromise becasue you still feel "dressed up", but it's much easier to fit into the sometimes crowded booths and dig around though all the bins of goodies on the floor. Usually I go to the show with a list of supplies and accessories to shop for that I can use for future costume projects. If I ever want buttons, ribbon, lace, or trim, this is the first place that I look, and I've also bought a wide variety of accessories like purses, hats, gloves, and parasols here too. This year I didn't really have a lot of specific things that I needed, so my friend Christy and I amused ourselves by trying on vintage accessories that matched our outfits. I had no idea how many navy and white dotted items there were in the world! 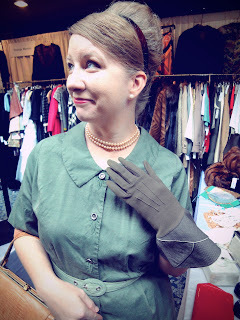 If you live in area and you've never been to the Antique Elegance Show before, I highly recommed that you check it out. 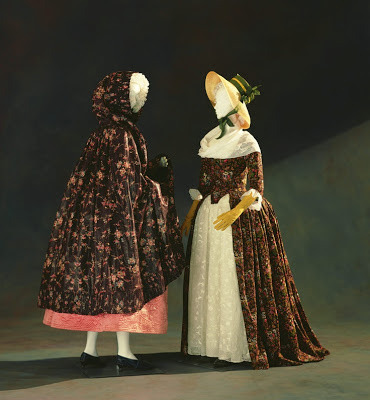 The next show is February 16th and 17th, and it will include a fashion show featuring coats, capes, robes, and other outer garments from the 1860's - 1960's. Also, Keven Jones and Christina Johnson from FIDM will also be giving a presentation on Royal Dress. I hope to see you there! 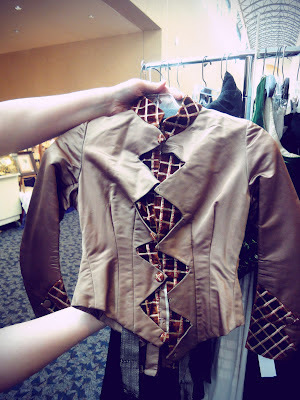 Drooling over an amazing 1880's bodice at the Vintage Martini booth. The full dress can be see here. You can see a few more photos from the weekend on my flickr. I also wanted to share with you the new exclusive 10% off code for kohls.com. You can use the code UBLOGTEN until October 24 and stack your savings with one other department specific code as well. Feel free to use this code and share it with your readers! And for your convenience, you can buy the Felicite curtains online in their window treatment shop. I typed in "Felicite" in their search bar to pull up the creme and noir curtians. Thank Kohl's! 1. There isn't any type of tight time-frame on this project, so don't worry if you can't start right away. I was thinking that it might be fun to organize a few meetups for curtain dress participants next summer at various costume cons, but that still gives people a lot of time to work on stuff. I also thought it might be fun to do a wrap-up post where I share all of the completed curtain garments here on my blog a year from now, and I can continue to add examples to my Pinterest board indefinitely. But I definitely don't want people to think that they can't join in because they have other things that they need to finish first. Take your time - it's all good. 2. 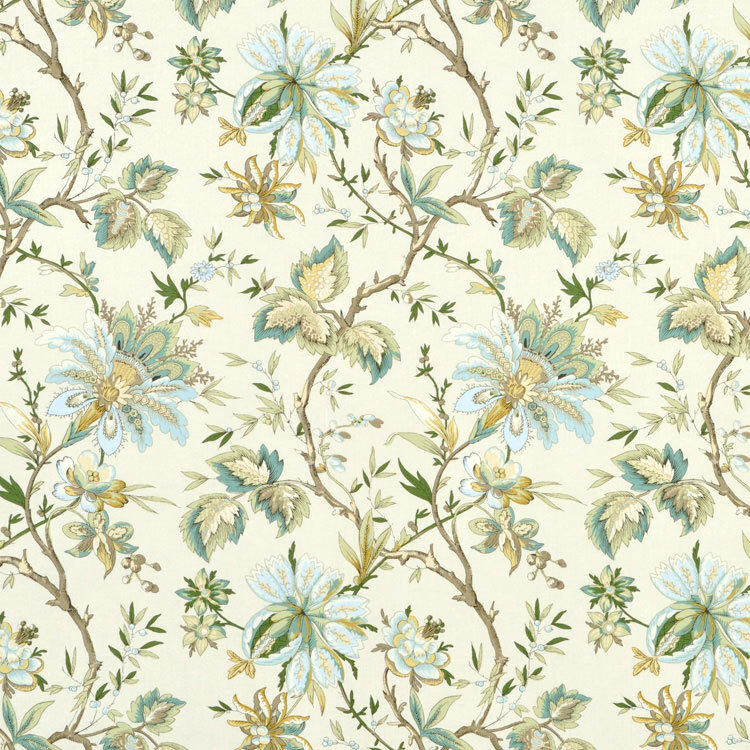 I mentioned that you could buy other colorways of this fabric by the yard, so I know there will be some curtain-alongers who aren't technically using curtains. But what about people who would like to use curtains, but they would prefer a different pattern? Well... why not? The more the merrier in my opinion! Half of this project is about the fun of making a wide variety of costumes with the same fabric, and half of it is about looking at curtains as a cheaper alternative for fabric. 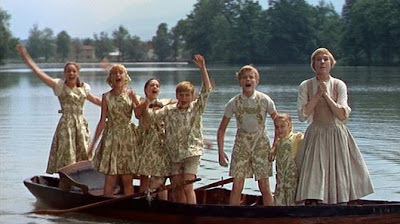 So maybe we'll just have 3 categories in the curtain-along: the original curtain dresses, dresses made in with the same print in different colorways, and dresses made out of curtains that use other mics. prints. 3. After my last post, I got a few more great suggestions about where you can find curtains or fabric for this project. 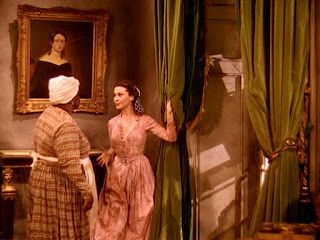 Did you know these curtains were also sold at Kohl's? I didn't! Kohl's has great sales and coupons, so you might be able to pick them up there for even cheaper than you can get them elsewhere. Also, I had several people mention that they found the fabric sold online at fabric.com and Fabric Guru, but when I went to share the links today, they appear to be already sold out. So it looks like some of you found those sales on your own! But keep searching for Felicite fabric online for other good deals. I found most of the colors sold by the yard for around $15, which isn't too bad if you just need a smaller amount for something like a jacket. 4. I know some people were questioning the scale or colors used in this print, so I wanted to touch on that. No, this isn't a reproduction print, so it's not going to be 100% accurate in every way, but it's still pretty darn good... and it doesn't cost $40 yard, so I'm willing to make some compromises. There are plenty of examples of garments made out of floral prints that are this scale or even larger, and as soon as I think "those colors aren't right" about any of the colorways, I always find an extant garment to prove me wrong. For example, I was worried that the "mineral" colorway might be too pastel, but then I saw this jacket from the Met that is a close match with the "mineral" color scheme, and I think it also resembles the shape of the flowers and leaves quite well. 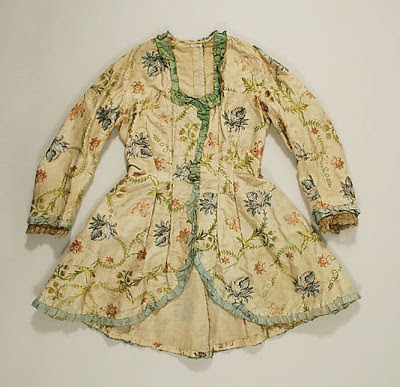 The Met jacket is brocade instead of a print, so I know that some purists will be deterred by that, but if you just want to make a pretty jacket and don't care about strict documentation, then I think it would be a wonderful choice as inspiration. Not every single dress in the universe needs to be a complete reproduction. Sometimes just capturing the essence of the period and having fun without going broke is good enough, and that's what this project is all about. 5. Here are all of the blog entries that I've bookmarked about this project so far. I know there are probably more that I'm missing, but I've had a busy week and haven't kept up with my blog feed very well. 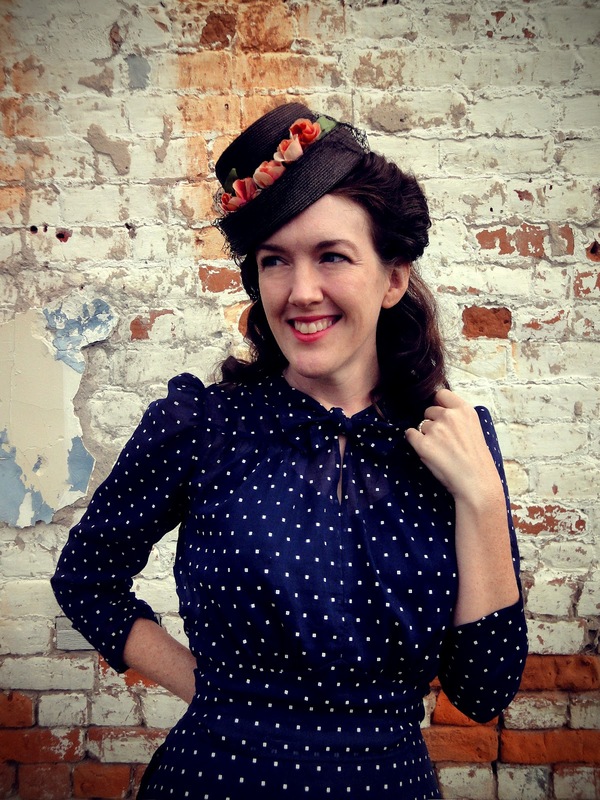 PLEASE let me know if you've blogged about this project so I can add you to my list! I'll be adding these blogs to my Pinterest page once people start working on their projects and have some photos that I can pin. Oh, and if you don't have a blog but would like to talk about your project, I'd be more than happy to let people do some guest posts here on my blog so you can show off your work to everybody. Some dresses just don't want to be made. This is one of them. I started this project back in February because I wanted a "quick and easy" vintage project to do as a break from more elaborate historical stuff. It started out well enough, and I was thrilled to finally be able to use some vintage sheer dotted swiss fabric that I had been hoarding for years along with a cute DuBarry pattern dating from 1940. But then disaster struck when it was time to add the sleeves - I had accidentally cut out 2 left sleeves and I didn't have enough fabric to cut another one. ARGH!!! Okay, I admit it. I totally overreacted. I had a big "woe is me" meltdown and then proceeded to angst over what to do with those the stupid sleeves for the next 5 months. I intended to wear this dress to 3 different events this past year, but each time I would pull it out of the naughty pile to finish it, I would get all worked up over the sleeves again and then put it back away. 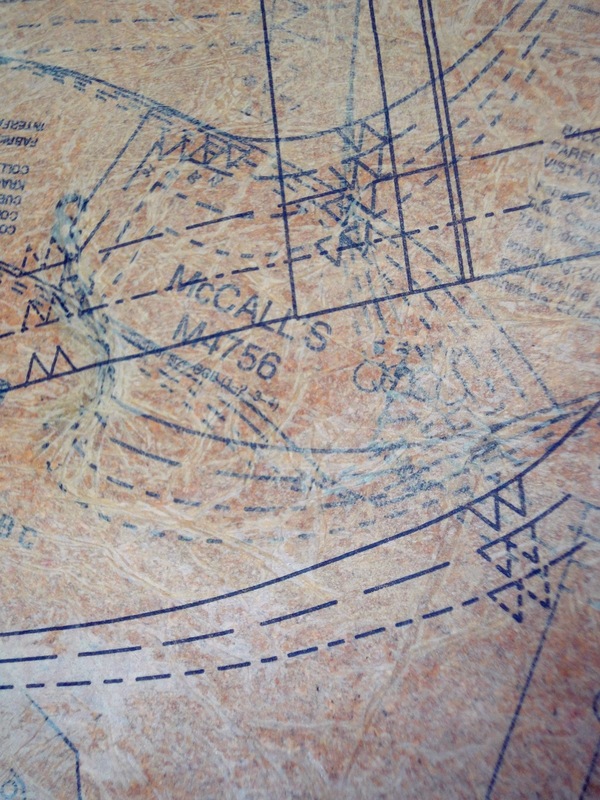 But finally last month some sanity came back to me and I thought to myself: "what would a woman in 1940 do if she had cut the pattern wrong?" Well, duh - she would have pieced together scraps of fabric to fix the sleeve and moved on! So that's what I did. Can you see my horrible mistake? My tragically ruined sleeves? Neither can I. Lesson #1 learned from this project: CHILL OUT! A little bit of piecing never hurt anything, and it probably looks more authentic now because of it. Lesson #2 was something that I should know my now, but apparently I don't. If you don't make a mockup, at least be sure of your size. I almost never make mockups with vintage patterns, and I thought this pattern was close to my size, but it really wasn't. 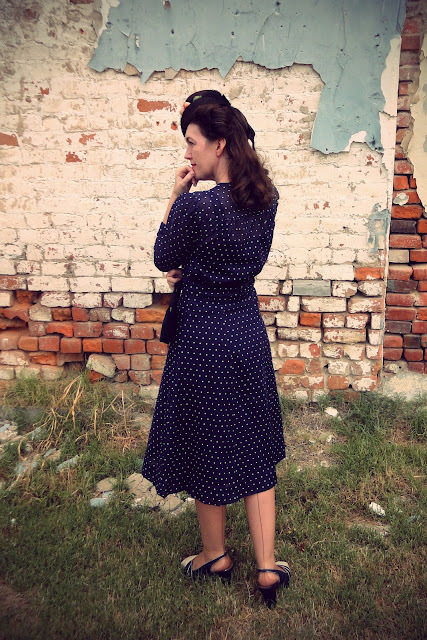 It was massively huge on me, so basically I made the dress, took the entire thing apart, re-cut the pattern, and then made it all over again. It wouldn't have been that big of a deal, but I had been hand-finishing all of the seams as I sewed, and it almost killed me to have to unpick all of that beautiful finishing work. *sigh* But it finally fits right and I think I have a better grasp of what size I really am now. So 7 months later, and my "easy" vintage project is finally done! 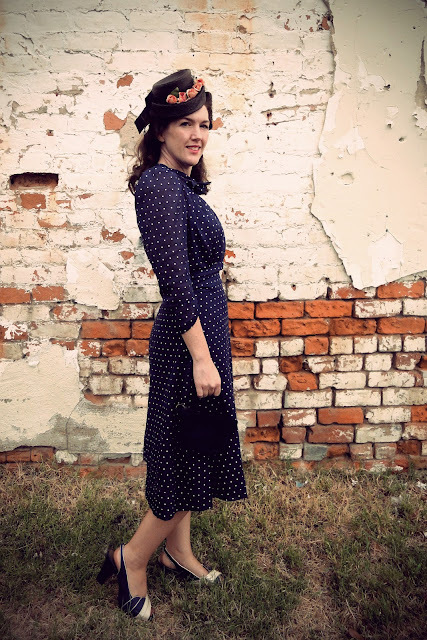 I finished off the outfit by wearing a little tilt hat that I bought in a local antique store, a $10 corde purse from Etsy, a vintage navy slip, some vintage seamed stockings, and some Madden Girl brand shoes that I found on the clearance racks at DSW last year. The shoes originally had a very modern flowered fabric on them, but they were such a great shape, so I painted them blue with acrylic paint to match my outfit. 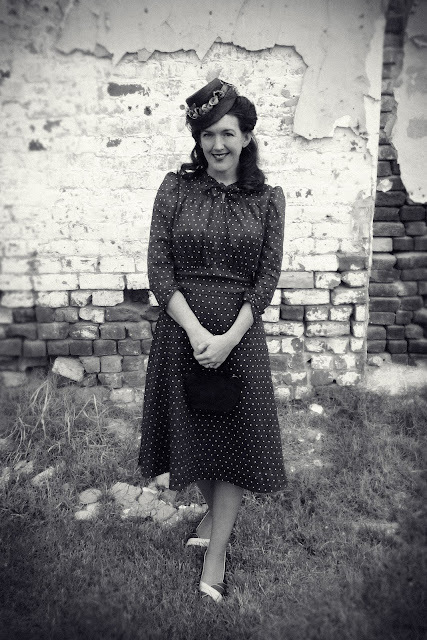 WWII era fashions have never been my favorites, and I was a little worried that this outfit would feel too "prissy" with the little neck bow and the poofy sleeves. But I really loved wearing this dress and I'm itching to make more things from this period now. If you are interested, you can see a few more photos on my flickr. If you read my blog at all, you know that I LOVE Pinterest and pin stuff like a madwoman. But most of the time, I don't bother change the title from what automatically pops up to include more info about where I found it. And sometimes I repin things onto my own blog, and I forget to list additional credit there too. I realize now how offensive this can be to the people who originally posted the images. I am very laid-back about people pinning and re-posting my own images, so I assume others feel the same way as I do, but I am starting to realize that I'm in the minority here and I need to be more careful about this sort of thing. If I have ever pinned an image from you or posted an image or anything else onto my blog and you were upset because I did not give you proper credit, PLEASE let me know so I can correct that and make amends. I hate to think that anybody out there is mad at me about something like this, especially since it is due to my naiveté and laziness vs. any malice or attempt to steal another costumers' work. I will try better to give everybody proper credit in the future. Also, I would like to make a public apology to Heileen for pinning a photo that she took of a chemise dress. I used this photo for research when making my mourning chemise, but I neglected to tell you all where I found the photo, and I just assumed that clicking through the pin would be good enough. My deepest apologies, Heileen, and I thank-you so much for sharing your photos with us all. I will not make this mistake again. the Curtain-Along is a go! I was really overwhelmed by all the wonderful responses that I got to the idea of having a curtain-along project, so I'm going to make this thing official and get us all started! Woohoo! First of all, I wanted to give you some more accurate measurements on the amount of fabric that you are getting in each curtain. The dimensions given on the package are 50" wide by 84" long, but once you unpick the hems, it is actually 53" wide by 96" long (134 cm X 244 cm). Sometimes those extra inches really help. You also get a tieback that adds another 8 1/2" by 26" piece of fabric when it is unpicked (21 cm X 66 cm). That averages out to $7.50 a yard for the creme fabric and $9.36 for the noir and crimson if you buy the curtain panels from Lowe's. This is quite a bargain compared to the same fabric at Joann's which is selling for $17.50 to $22.50 per yard on sale. Some people have mentioned that Lowe's will not ship internationally, but I found the creme and noir curtains on Amazon (creme, noir), and Sears (creme, noir). I also saw a few on ebay, and I'm sure there are other venues that I am overlooking. You might try searching for Waverly Felicite to find other sellers. I couldn't find the crimson colorway anywhere other than Lowe's, but if you don't have access to a Lowe's and that's the color that you are interested in using for the curtain-along, let me know and I'll buy some and ship them to you. Also, I thought that if any of us end up with left-over cuts from our curtains, I could help you advertise that here and maybe somebody would like to buy half of a curtain for a small garment, or maybe they just need a little extra to finish a project. So what can you make with the amount of fabric that you are getting in a curtain? Well, from what I have calculated so far, half of a curtain (or less) should be enough for a baby or toddler dress, a spencer, a man's waistcoat, a boy's jacket, doll clothes, or a fabric-lined bergiere. 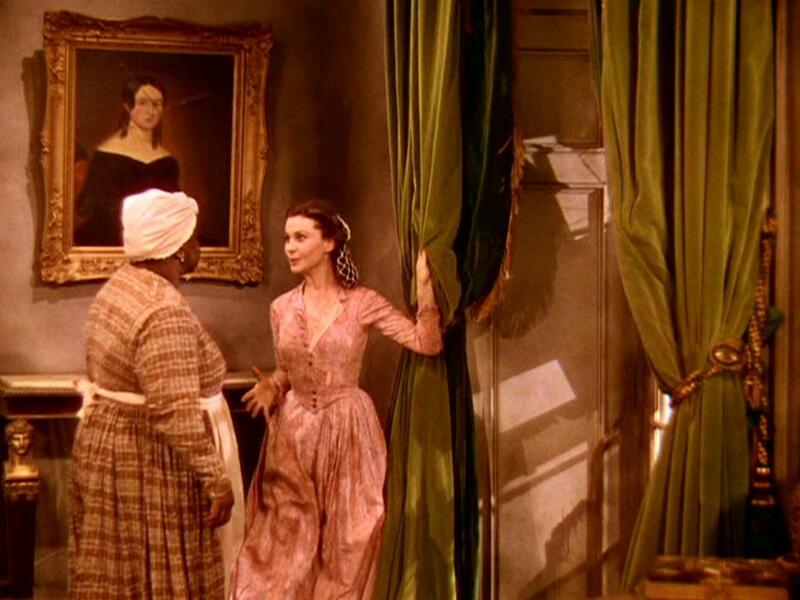 One curtain will make a petticoat, a jacket, a caraco, a bedgown, a bibbed apron, a girl's dress, a medium sized cloak, or a banyan for a smaller person. Two curtains would be necessary for a matching skirt and jacket, a round gown, an open robe, a long cloak, or a banyan for a larger man. You would probably need three curtain panels for a robe a la francaise, a polonaise, or any other type of gown with a full overskirt and matching petticoat. And with that, I will leave you with this excellent article by Kendra exploring the history of 18th c. Indienne print fabrics, and I also made a new Pinterest board of Indienne print inspiration which documents a variety of garments that use similar colorways to the Waverly curtians, and it also has plenty of examples of bold, large-scale botanical prints. I can't wait to see what you all make! I'm wrapping up work on my dress for the Antique Elegance show next weekend, so I've started prepping for my next project - a dress to wear to the DFWCG's Georgian Picnic in November. 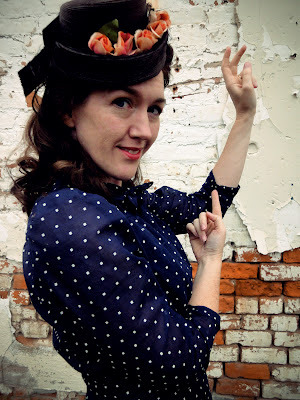 When I made my "Dutch print madness" outfit this past summer, I also bought a second curtain panel from Lowe's, and my idea was to make a jacket to match my Indienne print petticoat so I'd have a slightly different version to wear to the picnic, but I wouldn't have to stress so hard over finishing a completely new dress. 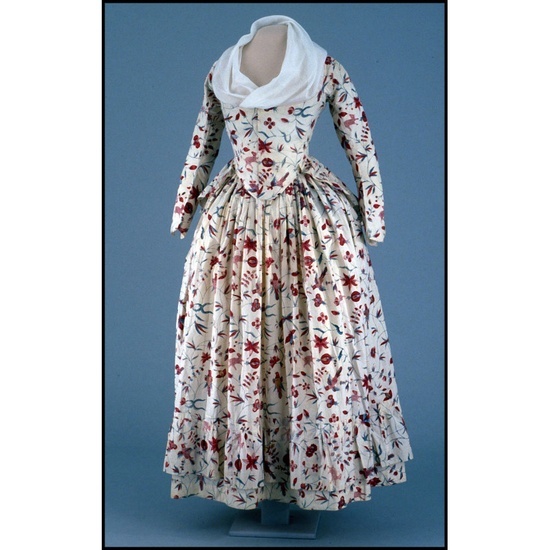 I'm basing my design on this print jacket and petticoat combo from the early 1790's. Since I finally have some good 18th c. body blocks to work with now, I'm hoping that the jacket goes together easily, and I think I'm going to hand sew this project as well. I can't wait to get started! 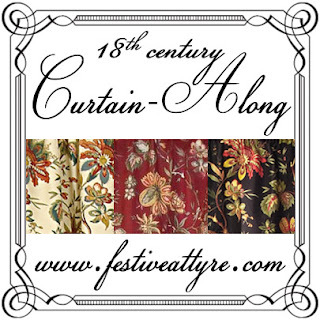 After my post about my Dutch dress last month, I noticed that several other costumers started snatching up these Lowe's curtains to make their own 18th c. garments. It's so cool to see all the different looks that you can get even when working with the same fabric, so I thought it might be fun to make a Pinterest board for all the Lowe's curtain dresses out there to celebrate all of our coordinating garments. It could be like our own little sew-along, but maybe we should call it a "curtain-along"! Dressed in Time just finished a beautiful shortgown, and I know American Duchess is working on a new dress with this fabric as well. But anyway, if you are making a garment out of this Waverly Indiennene print, or you know of any others out there, please let me know because I would love to tell everybody about your project and include it on my board when it is done! And just FYI, there are several colorways of this fabric if you like the general pattern, but you want to be a little bit different. 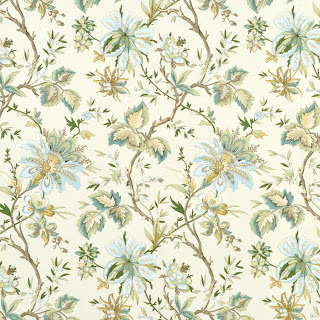 In addition to the 3 versions of curtains that Lowe's carries (creme, crimson, and noir) I noticed that Joann's is selling multiple versions of this same print fabric now too. The only difference is that the Joann's fabric is on regular cotton instead of sateen... oh, and it's a lot more expensive! But I love the blue and white colorway. I think that one in particular would make a gorgeous 18th c. dress. 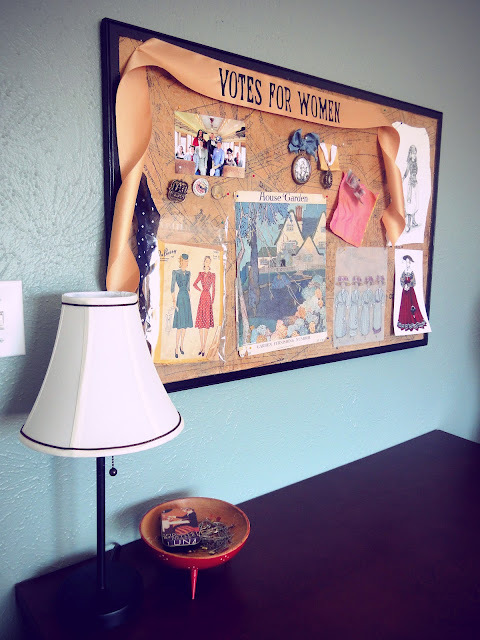 I've been using tissue paper pattern pieces in mixed media art for many years now, so when I decided to spruce up a boring old cork board for my sewing room re-do, this seemed like a really fun (and fitting!) technique to use. It's not rocket science, so I didn't bother making a step-by-step tutorial or anything like that. All you do is decoupage over the cork with your pattern pieces and keep overlapping them and layering them until you get the look that you want. I would normally recommend using Modge Podge for this sort of thing, but I didn't have any on hand, so I used watered down Elmer's glue this time, and that worked great too. 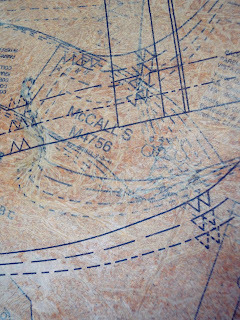 The tissue patterns create a beautiful antique-looking surface that reminds me of parchment or leather. It almost seems a shame to cover it up with stuff on my pin board. But this technique would also work great as surface decoration for lampshades, furniture, or other sewing room nick-knacks. I thought about pattern-collaging those big letters that you hang on your walls... if I could just figure out what to make it say. I don't think "she who dies with the most fabric wins" would fit on the walls of my small sewing room. Darn. I finished it up the board by painting the wood frame with glossy black paint, and I'm using some short ball-headed sewing pins to pin things to my board. 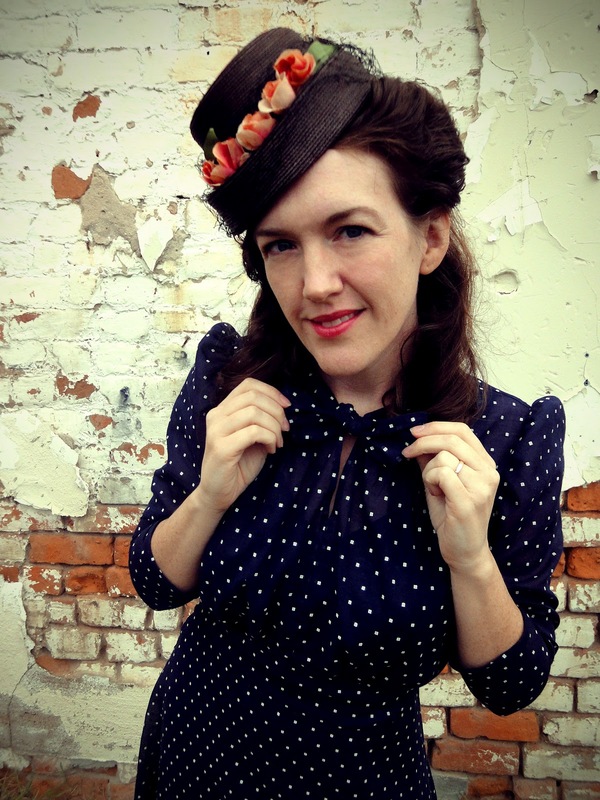 And BTW - thanks to all of you who have been sharing pics and project ideas from your own sewing rooms. It has been so much fun to see how other costumers organize and decorate their spaces.